o·ver·kind (ˈōvər’kīnd), adj. too kind; She means well but is overkind to the point of annoyance. [ME overkinde. See OVER-, KIND1) —o·ver·kind·ly, adv. 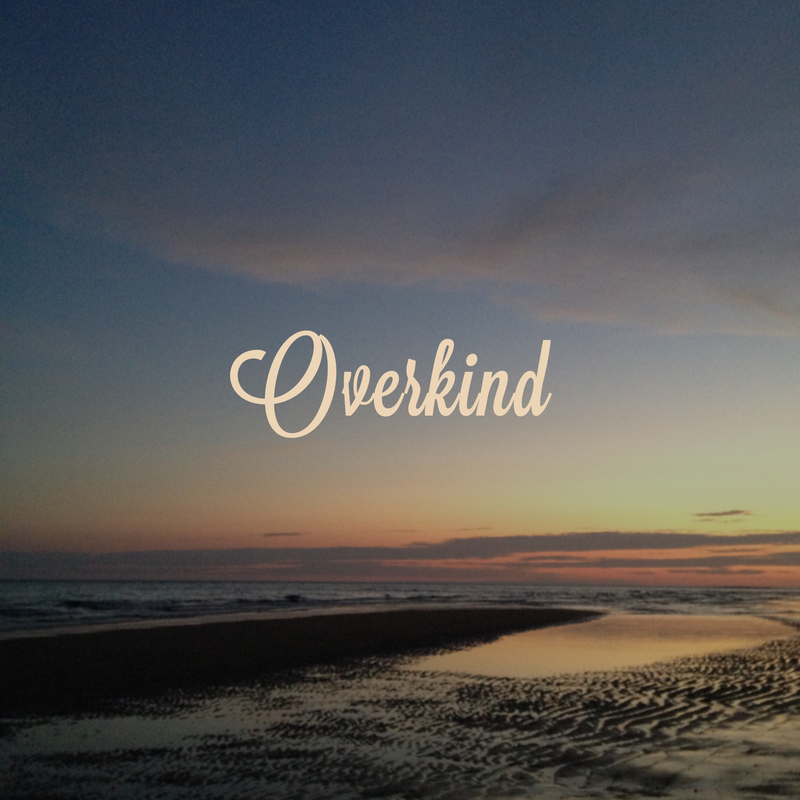 —o·ver·kind·ness, n.
Sandra subscribed to Overkind.com because she needed a little more kindness in her life. She had recently gone through a breakup, she was living away from her family, and she liked to keep to herself. She didn’t want to burden the few friends she had with late night schmaltzy talks about her woes. Even thinking about her problems as woes made her recoil. She just needed some momentary support. She stumbled onto the Overkind site after reading some article on The Huffington Post’s “GPS for the Soul” section—which she couldn’t believe she was actually reading; I mean, “GPS for the Soul,” really? Sandra had always liked the word “over.” Over always made her think of climbing a mountain and taking in an expansive view, or crossing a bridge to the other side. It was an empowering sort of word: over. When added as a prefix, it could make words better: overjoyed, overlap, overleap, overlay, overcome. She would overcome this moment. Overkind would help. She went to the subscribe page, picked “Overkind Package #1” and entered her personal information. Then she closed her laptop and went to sleep. Sandra was pleasantly surprised that first week with the thoughtfulness of Overkind. When she clicked on the email in her inbox each day, she felt recognized and appreciated. That first day, her email message contained links to articles about contemporary art (one of her listed interests), a word of the day (she had said “yes” to the question about loving language). There were also several high-resolution photos: a close-up of a coral hibiscus, a black-and-white photo of a blues singer, mouth open in song. There was a recipe for black bean soup and instructions on how to grow your own herb garden. When Sandra checked her mailbox on Wednesday, she found a thick envelope with seed packages of basil and thyme and rosemary. They were wrapped up in that pretty paper that has pressed flowers in it. There was a mix CD featuring some of her favorite artists and a card with an inspirational quote by Hafiz. At the end of the month, she received a notice via email that she would get a UPS package soon: her tailored gift! She rushed home from work on Friday to see if it had arrived and it had. The package was tucked under her front door mat. She could hardly contain her excitement as she rushed to open the door. Dropping her bag on the kitchen table, she tore through the envelope to reveal what was inside and she found: a purple pencil skirt. Maybe she had gotten someone else’s package by mistake. But she checked the address and the invoice inside. No, this was for her. But it wasn’t for her. She tried to think of anything she could have answered to make this gift make sense as “tailored for her” but it wasn’t. She hated purple. She hated tight-fitting clothing. She wasn’t a huge fan of skirts. She wondered what to do. Overkind had been spot on so far but something was amiss. Sandra flipped open her Macbook and pulled up the site. She looked everywhere but could find no phone number to call, only a generic “Contact Us” form. In the subject line, she wrote “Urgent Matter,” and then she wrote: “Dear Overkind Employee, I am deeply disturbed at the ‘tailored gift in the mail’ I just received. There seems to be no attention to my likes or dislikes in the creation of this gift. Please get back to me as soon as possible.” She signed with her name, email, and cell number. The weekend passed and she expected to hear back on Monday, but she didn’t. Emails kept coming: with quotes and recipes and photos and links. There was a pdf of a short story from The New Yorker. She couldn’t keep up. It was all too much. She went to the website to cancel her subscription, but the website said to use the “Contact Us” form to cancel. She wrote a second message, this one saying that she just wanted to end her subscription. She didn’t need a new gift, but she was done with the service. No response. She sent several more messages and they all went unanswered. Her virtual best friend, the one she had paid for, was ignoring her. Her messages became more irate, more defensive. She stopped using a salutation. One evening, Sandra returned home from work to find her empty house: the slick floors, the clean kitchen, the keys hanging in place on their hook. She hung her coat and put her bag on the chair. She could hear her heels clicking against the hard wood floors and suddenly she couldn’t bear the impenetrable sound: solid hitting solid. She collapsed in a heap on the living room floor—on top of the rug she and her ex picked out together, next to the couch they used to lie on, under the lighting fixture they installed themselves—overcome. Her attempt to buffer herself from it all was backfiring. No amount of kindness would undo what was over. And she wouldn’t be over until she moved through. The messages and packages and gifts would still arrive, or they wouldn’t, but they wouldn’t be for her, not really. This kindness was paid for and manufactured. And they hadn’t gotten it right. No matter how many questions she answered, she wasn’t really known. Not by some random people running some website. What had been comforting the first few weeks now overwhelmed her. She hadn’t thought about the excess of “over,” the overage. But that’s what all this was: too much. Now, the words flooded her—she could hear them all in a refrain: overflow, overgrow, overlook, overrun, overwork, overwrought, overload, overblown, oversleep, overspend, overstay, overpower, overboard, overburden, overdrive, overdress, overdone. Over. Over. Over.